Glass working techniques have been used since 3500BC and the rudimentary methods of lampworking, fusing and casting were among the first used to create beads, vessels and jewellery subsequently found in ancient Egyptian sites. Fusing particularly was superseded by the development of the blowpipe and glass blowing techniques and although there was a resurgence of the use of glass in the 13th and 14th century, it was not until the 20th century that fusing has gained popularity in contemporary art glass. 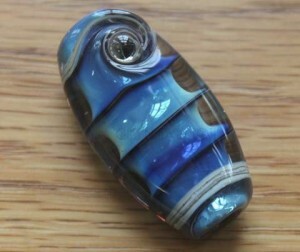 All of the artists at Atlantic Glass Studio are passionate about these techniques. This ancient technique has become more popular in recently years especially as the tools required have become more readily available to anyone who wants to learn this craft. 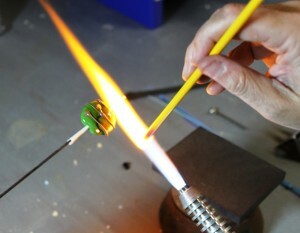 The technique involves melting thin glass rods using a flame (propane and oxygen mix) onto thin, clay coated, steel rods or mandrels, and then shaping the glass using hand movements, gravity and tools to produce beads. The pieces are then cooled slowly (annealed) in a digitally controlled kiln, this strengthens the glass. Once cooled the steel rods are removed (the clay coating enables this), the holes cleaned of the clay mixture and beads inspected for quality. The most commonly used glass is soft or soda glass which melts at a lower temperature. Many lampwork artists also use borosilicate glass (Pyrex) which requires higher temperatures to work it; marbles and structural pieces are often made using this glass and are created ‘off mandrel’, that is without using the steel rod. Much of the soft glass used comes from Venice still, but there are many other manufacturers of the raw materials we use and many of the glasses have interesting and different qualities such as a glass made by a US firm, Double Helix; this glass has silver impregnated into it and you can make the glass create different colours and effects depending on the mixture of gasses used in the flame. Often referred to as warm glass (as opposed to hot glass which works with molten glass), the process of fusing uses a kiln to structurally combine separate pieces of glass by accurate control of the kiln temperature so that the pieces fuse together retaining and/or creating line, shape and texture. This basic tech nique has many variations and effects created by using a wide variety of different glasses and other ancillary materials to enable a huge range of different effects and styles. Once fused, pieces can be re-fired at a lower temperature over moulds to create three dimensional shapes such as bowls. 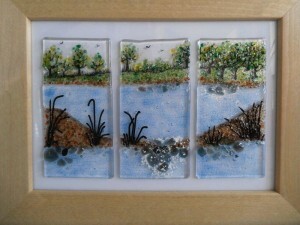 Though exact firing cycles and temperatures vary from artist to artist depending on glass used and technique explored, most fused glass is fired to around 780 to 810 degrees C (an average domestic oven reaches 250 degrees C). At these temperatures the glass begins to flow and combine with the pieces adjacent often trapping small bubbles of air, an inherent characteristic of fused glass. 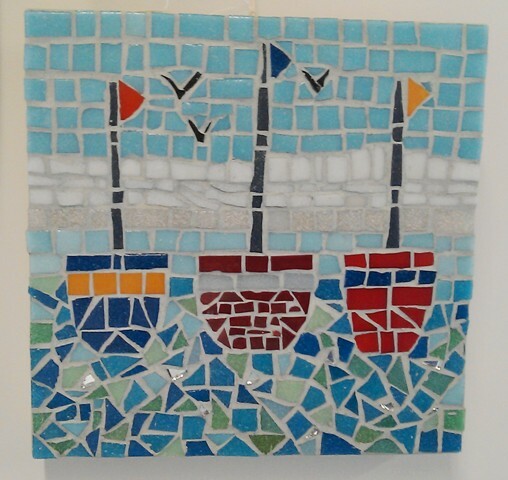 Throughout history mosaic has been used to ornament the most precious living spaces. Each era has seen this versatile technique reinvented and contemporised spawning numerous styles and effects from the same basic components: tessera (the various pieces), the base, adhesive and grout. I love to incorporate upcycling, often using materials excess to requirements from a variety of sources and these often inspire my design choices. The artists at Atlantic Glass Studio use a range of silver smithing techniques in their jewellery work, from simple forging to casting and stone setting. This is a diverse subject with a host of different techniques which have been developed over the millennium. Some techniques such as forging, the hammering and shaping of metal, have changed little over the centuries, with tools like anvils still being used today. Other techniques such as etching have changed dramatically with the use of transfers that allow pictures from your computer to be transferred onto the metal.